Love the color! What tile is this? how is this application different -usually w mosaic 12x12 you can see the grout lines within the wall surface this looks like it comes on a sheet the entire size of wall like a mosaic slab- is there a secret or is it inherent in tile plus application/grout? is this 1 x 1 tile? and what color exactly is this in the bisazza smalto? Shower Ledge - Hi! How wide is the ledge and what distance up from the floor? Thanks! So about 6 inches deep and just under 48 inches high! Thank you very much!!!! You're welcome and happy showering! Shower head? - What brand and model is that shower head? Are you in Australia because its locally manufactured? How was the shelf built in and secured? where did you organise this? - Love the shelf and looking to do something similar in my own bathroom but wondering how it is installed and where the materials/persons are that complete it? Or could it be done DIY? The shelf is made from stud framing lined in villaboard and membraned and then mosaic tiled. Unless your competent in all these trades leave it to the builder. Which Bisazza tile? - The Bisazza website is fairly overwhelming. Can you identify the particular tile? Thanks. For memory as it was a while ago it was Smalto and a translucent blue tile. Throw or towel? - Love the colorful throw or towel? Might you share the source please? where can i get the tile ? 6. Clean your bathroom tile. Scrub the grout between floor and wall tiles with a mixture of baking soda and water on an old toothbrush. Work the baking soda paste into the grout, then rinse off with clean water. 28. 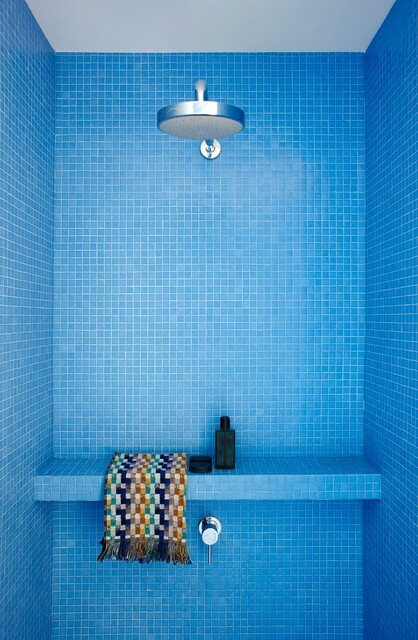 This Australian shower by Scott Weston Architecture Design features a bold blue tile by Italian tilemaker Bisazza. The custom ledge holds a multihued Missoni towel.